Our made-to-order signage solutions are designed and engineered to meet both the structural municipality requirements of your area and the longevity of lifetime use. Our years of experience will assist you throughout the entire process. Here is a diagram illustrating the fundamentals of the sign monument installation process. 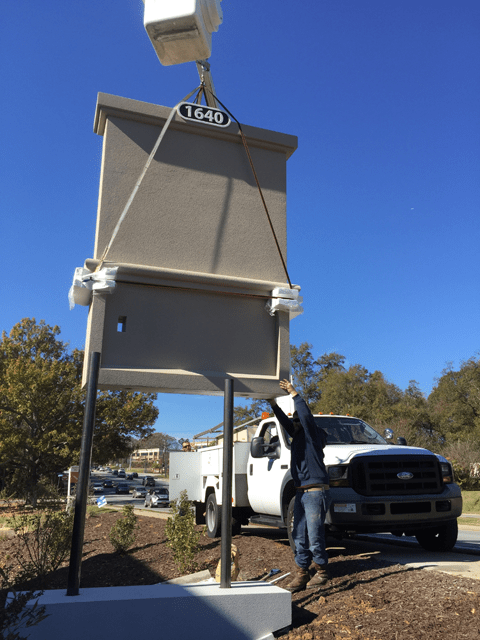 While most of our sign monuments can easily be managed by a few strong hands, there are times when equipment makes the installation task easier. This example illustrates a 12 foot high vertical monument model design that was too tall for individuals to lift. The customer arranged a bucket truck from a local rental shop and used the foam packing material to protect the sign while lifting it up and sliding it down on the steel installation pipes. Yes, we brag that our sign monuments are designed to rest directly on the ground without the need for a concrete pad, but in this particular case wind load was a factor with the sign being tall and narrow. We provided the specifications for the concrete footer details, included a wood form for the concrete form and supplied the schedule 40 steel pipe. This customer saved a small fortune versus hiring a local contractor and mason to complete a simple project that met all local Code! We will walk you through the How To Install Sign Monument process. Custom monument signs provide a sense of distinction and permanence to your property. Our sign monuments are the style most desired and required by municipalities nationwide for an all over better looking community. With over (2) decades of nationwide success, we will make You Look Your Best! This entry was posted in Business Signs, Commercial Signs, Installation Guides - DIY, Monument Signs, Property Developer Signs by BSM Staff. Bookmark the permalink.